QWebber is the program that promises to enhance browsing experience by providing various useful tools. Unfortunately, users soon find out that this program shows commercial advertisements only and it falls into the category of adware programs. 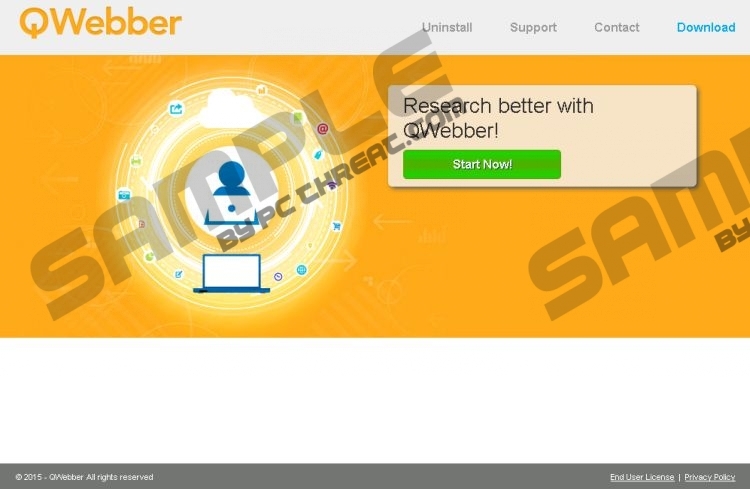 Researchers working at pcthreat.com have found that QWebber is going to show in-text ads, coupons, banners, video-ads, and pop-ups. All these ads will be displayed through Internet Explorer, Google Chrome, and Mozilla Firefox. Thus, if you use any of these browsers, you will definitely notice the presence of advertisements. The only way to get rid of advertisements is to delete QWebber. Luckily, it is not difficult to do that, but we still recommend that you read through this article first. It is likely that you will see new add-ons added to your browsers after the installation of QWebber. They will disappear after you remove this adware program. In fact, it is advisable to erase this program as soon as possible. You should do that very quickly because ads it displays might redirect you to corrupted websites. These ads might seem really decent because they are based on your interests. In other words, this adware program records various details associated with your web activities in order to provide you with relevant advertisements. Our specialists say that it is really dangerous to click on those advertisements because you might end up on unreliable websites and thus encounter malware. Yes, it is more likely that QWebber will cause harm to your system instead of acting beneficially. QWebber is not the only undesirable program. Our researchers are 100% sure that there are hundreds of other advertising-supported applications published by SuperWeb LLC. Luckily, you can protect your system from future malware. All you have to do is to install a trustworthy antimalware tool on your computer and start surfing the Internet more cautiously. It would be also wise not to visit untrustworthy websites. Finally, you should never keep unreliable programs installed because they might attract other suspicious programs. In order to stop commercial ads from appearing, you have to fully remove QWebber. This can be done via Control Panel. If you have no idea how to do that, you can use our manual removal instructions which you will find placed below this article. The manual method might seem too complicated for less experienced users. We understand that and we suggest acquiring an antimalware tool if you are one of them. It will be enough to click the Scan button and the automatic tool will remove all the existing infections for you. If you acquire a trustworthy tool, e.g. SpyHunter, it will also protect your system from other malicious applications (e.g. Trojans, rootkits, ransomware, etc.) that might try to enter your system in the future. Find the unwanted program and right-click on it. Access the Metro UI menu by tapping the Windows key. Start typing Control Panel with your keyboard and open it. Quick & tested solution for QWebber removal.